The weather has been a bit wonky lately. One day you can't feel your face and the next its all 50 degrees like its no big deal. What's a girl to do? Especially when going out, do you do the chunky sweater? Too sweaty. How about a nice blouse? Boring. A nice compromise is the sweetheart mesh top. Stay with me. All of the intrigue of a date night approved outfit with the coverage that is necessary for January. OK so please remove the necklace, it's ugly. But I had to post it because of the price. 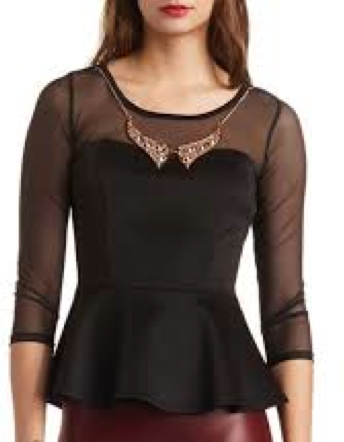 And a great peplum can be worn as is or add a skinny belt. A little lace is just lovely and I like that it continues all the way down the blouse. When you wear this bombshell of a top, try not to make the face this model is making. It's not a good face. Just smile because you know you look incredible. And a short sleeve option. I love the pin dot pattern here as well. What do all of these tops have in common? A sweetheart neckline. This very small detail adds just the right amount of femininity to an otherwise sassy top.